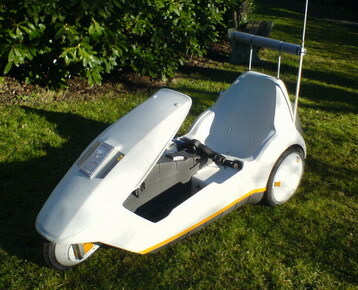 The Sinclair C5 is a three-wheeled recumbent bike, with an electric motor to provide pedal support. It was developed by the British inventor and entrepreneur Sir Clive Sinclair (also known for his home computer kits ZX 81 and ZX Spectrum) and was the first mass-produced electric bicycle. But due to a bad marketing and very negative and squibbing press reports it was a total flop when it was introduced on the market in January 1985. And so the production was quit in the same year after just approximately 17.000 units build. Despite this launch failure the C5 enjoys great popularity within a small group of fans and attained cult status. Page3 Exhumation of a motor | Let there be light! Here you will find pictures from the restoration. Maybe a useful resource for all C5 hobbyists. The official Sinclair C5 website. Here you can still order original spares. A good forum and further spares and tuning parts are available on C5alive.com. Helpful tips and tricks and electronic repairs can be found on C5martin.co.uk. SinclairC5.com is a very interesting fan website with lots of technical information and documentation. The repair blog from Camp0s inspired me to make my own C5 diary. Also an assembly of a gearshift has already been made by someone. And here someone even build a complete self-made construction of the chassis! If you also want to repair your C5 you should have a look at these interesting restoration images. or on the forum on yourc5.com. And finally something really strange: a jet powered Sinclair. Made in England. Needless to say.